In 1995, David Hockney – the iconic artist known for his captivating, pastel-hued portraits, Pop Art paintings and vivid landscapes – staged an exhibition at Yorkshire’s Salts Mill entitled Dog Days, comprising 45 paintings of his two dachshunds. At the time, the dogs Stanley and Boodgie were eight and six respectively, and Hockney’s adored companions. His extensive study of them – which was three months in the making and required meticulous planning on behalf of the artist, who set up easels around his house in order to capture them quickly in various natural poses – is testament to how he cherished them. “Only the owner could have painted that,” he said, referring to the intimate portraits, to The Telegraph at the time. The dachshund (or sausage dog, as it is of course colloquially known) has long been a popular breed: Picasso had Lump, and Andy Warhol had Archie, for example. 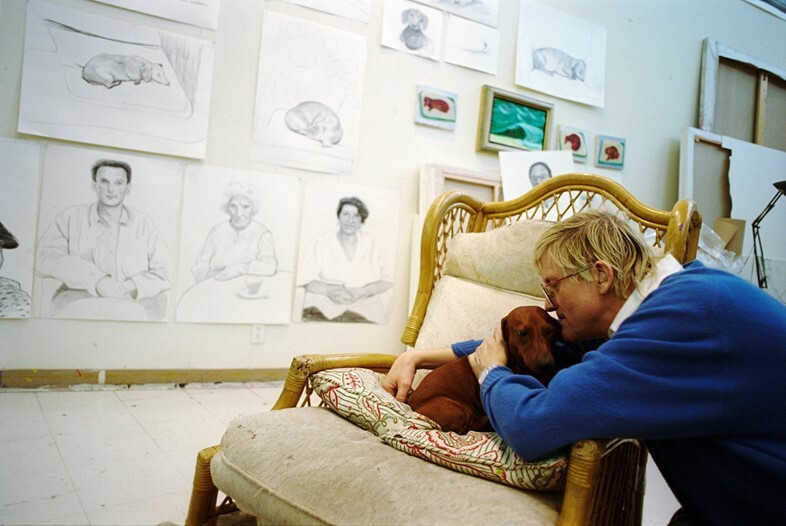 Hockney’s love of dogs began in childhood with his family’s mongrel, Paddy, and he was inspired to buy a dachshund puppy after “[falling] in love with” his neighbour’s, so Stanley arrived first and Boodgie two years later. The pair lived with the artist in California in the 80s and 90s, frequenting both the beach and a local park in the Hollywood Hills often. Their cushions were in Hockney’s studio, and they took to sleeping his bed, too. At a time when Hockney was isolated by the loss of four close friends to AIDS and his deteriorating hearing, it seems he found solace in both the company and depicting of Stanley and Boodgie. As well as the portraits of Stanley and Boodgie that Hockney created, his colourful California house was also apparently filled with dachshund paraphernalia. Small models of the hound dotted around the kitchen and sitting room, vintage photographs of famous sausage dogs, a comb fashioned like a dachshund, and a calendar of the breed could all be spotted in his home. Looking at photographs of Hockney with the dogs, drawings of them are seen on his studio walls, and he is more often than not embracing or gazing at them. Hockney began capturing them sleeping, eating, curled up together, and (somewhat bizarrely) sitting upright, little front legs dangling before them. The exhibition and subsequent book, Dog Days, was successful, particularly with the art-going public, and seen as a charming departure from Hockney’s usual subject matter. Critics were less certain at first: “Their technical competence, particularly the later ones in the series, and the sheer cheek of the project, save them from Cruft’s sentimentality, but watch out for a rash of ‘Dog’s Dinner’ headlines,” wrote Jon Stock in The Independent in 1995. But Dog Days has undoubtedly endured – the Thames & Hudson-published book is still in print and stocked in gallery bookshops two decades on. Dog Days is available now, published by Thames & Hudson.